Gum disease has been linked to a greater rate of cognitive decline in people with Alzheimer's disease, early stage research has suggested. The small study, published in PLOS ONE, looked at 59 people who were all deemed to have mild to moderate dementia. It is thought the body's response to gum inflammation may be hastening the brain's decline. The Alzheimer's Society said if the link was proven to be true, then good oral health may help slow dementia. The body's response to inflammatory conditions was cited as a possible reason for the quicker decline. Inflammation causes immune cells to swell and has long been associated with Alzheimer's. Researchers believe their findings add weight to evidence that inflammation in the brain is what drives the disease. The study, jointly led by the University of Southampton and King's College London, cognitively assessed the participants, and took blood samples to measure inflammatory markers in their blood. A majority of participants - 52 - were followed up at six months, and all assessments were repeated. 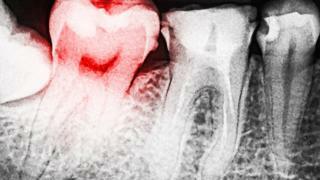 The presence of gum disease - or periodontitis as it is known - was associated with a six-fold increase in the rate of cognitive decline, the study suggested. Dentist Dr Mark Ide from King's College London told the BBC News website he was "surprised" by the rate of decline, and said that as patients with gum disease chew on their teeth they were effectively giving themselves "mini-injections" of bacteria into their bloodstream. "In just six months you could see the patients going downhill - it's really quite scary," he said. Higher levels of antibodies to periodontal bacteria are associated with an increase in levels of inflammatory molecules elsewhere in the body - which in turn have been linked to greater rates of cognitive decline in Alzheimer's disease. Prof Clive Holmes, senior author from the University of Southampton, said the results were "very interesting" and proved that this study needed to be carried out again but using a larger number of participants. "However, if there is a direct relationship between periodontitis and cognitive decline, as this current study suggests, then treatment of gum disease might be a possible treatment option for Alzheimer's," he said. He also said his researchers had taken into account the fact that gum disease may become more common in those people with Alzheimer's, because of a reduced ability to take care of oral hygiene as the disease progresses. Dr Doug Brown, director of research and development at the Alzheimer's Society, also recognised that the study "adds evidence to the idea that gum disease could potentially be a contributing factor to Alzheimer's". "If this is proven to be the case, better dental hygiene would offer a relatively straightforward way to help slow the progression of dementia and enable people to remain independent for longer," he said. But he also described the study as "small" and said it was currently "unclear" whether the gum disease was the cause or the effect. "We don't know if the gum disease is triggering the faster decline of dementia, or vice versa," he said. In the UK around 80% of adults over 55 years old had evidence of gum disease, according to the adult dental survey of 2009, which is the latest data available. There are around half a million people living with Alzheimer's disease in the UK .